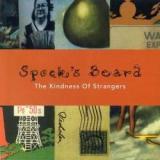 Just a year removed from their previous album, Spock’s Beard launched right back into the studio to crack out their third full-length, The Kindness Of Strangers (possible connections to A Streetcar Named Desire unknown). After definite signs of solidifying their own thing on Beware Of Darkness, this is the point where the Beard got there, nailed it well and didn’t lose steam for a good number of years. The Good Don’t Last opens the record as one of three epics found on it. Some grandiose organs lead into the playful and precise jamming that the band excels at with some upbeat acoustic chords that set the pace for what I’d say is a happily twisted album. The songs aren’t smiles and sunshine throughout by any means, but even in the most lyrically critical moments there a distinct optimism that makes me happy listening through the disc. It could also just be the stellar musicianship, but I digress. This song is also the first time the Beard brings in a full string quartet to augment their traditional band ensemble and it works really well for atmospherics. Anyhoo, all hyperbole aside, The Kindness Of Strangers is the album where the band managed to brilliantly mash up the otherworldly zaniness of The Light with the more streamlined vision of Beware Of Darkness to display the best of both worlds. From here until the closing notes of Snow, it is all sweet, sweet gravy in this reviewer’s ears.